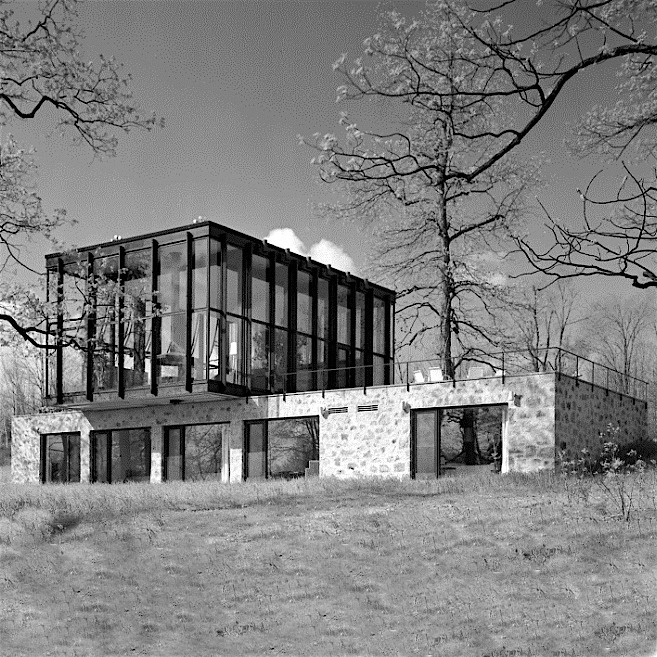 Though not as renowned as his Glass House, Philip Johnson’s Wiley House (named after its developer/art collector client) is an exceptional piece of transformative, Modern design. Immediately recalling two different typologies – classic to the horizontal stone base, modern to the striking cantilevered top with vertical glass panels subdivided by slender timber blades, Johnson’s Wiley House is a beautifully executed exercise in opposition. Sharing features with his Glass House, inclusive of a swimming pool with diving pad and certain landscape cues, the Wiley House has changed hands a number of times, recently undergoing a full restoration and renovation by Roger Ferris + Partners that included the addition of an ‘art barn’ derived from original Johnson schematics.